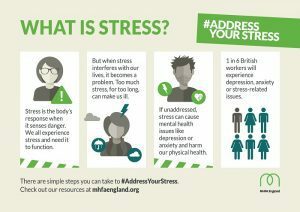 This year Mental Health Awareness Week’s (14-20 May 2018) theme is STRESS: are we coping? Mental health mentor, Craig Fearn explains what stress is and why it should be addressed before it becomes debilitating. Poor mental health issues are responsible for 91 million lost working days in the UK, costing the workplace an estimated £30 billion a year. At any one time 1 in 6 working age adults will have symptoms associated with mental ill health. 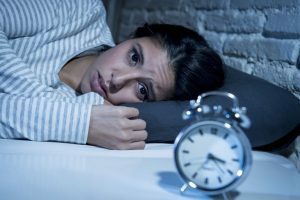 CIPD’s 2016 Absence Management survey, conducted in partnership with Simplyhealth, reported minor illnesses remain the most common cause of short-term absence from work, followed by stress. In fact, stress, acute medical conditions and mental ill health continue to be the most common causes of long-term absence in the workplace. With nearly a third of organisations reporting an increase in stress-related absence over the past year and two-fifth, a rise in reported mental health problems. Stress is primarily a physical response. Historically, when we were being hunted by saber-toothed cats, stress was one of the tools we evolved to help us stay alive. That feeling of unease; the heightened sensed; the raised heartrate; ready to run, if we stumbled upon the unexpected or more importantly something that was out to eat us. As we have moved through the ages, man has become the dominant species and the threats that we face from predators has drastically decreased. So, why do we still experience stress? Consequently, our stress response now has new threats to deal with for example new environments that make us feel uneasy. Thus, rather than evolved out of our make-up, the stress response has been co-opted and repurposed to include anything that makes us feel uneasy or uncomfortable. Our office, the workload that we can’t cope with, the family get together, the crying child, public transport…the list goes on and on. But, how many of these events really pose us mortal DANGER? I believe the place to start with any problem, is to identify the cause. I prefer to proceed as the tradesman arriving to fix the leak or get the power back on. There aren’t many people that will say this is what’s wrong and this is how you fix it. Can you just do this please? Normally, the tradesman will get the story about what their client believes is wrong and then go through their own checklist ensuring that they have not just addressed the surface issue but are confident that when they leave the problem will not re occur. This is my preferred approach to helping people presenting with stress. A conversation that starts with a client telling me “I’m stressed and it’s all down to work” does not even begin to tell what is going on. It may be that work is the main issue that they are experiencing, but what is it about that situation that’s causing the stress? Is there anything else that’s impacting on them that maybe is being disguised by the work issue? Is this recent or has it been going on for a while? None of these things can be looked into if we just take the self-diagnosis on face value. There are some very good pieces of generic life advice that can help, take more physical exercise, change your diet, reduce your intake of alcohol and my favourite; do things that you enjoy. Great advice for the right people, but I have another that I think is even more important. TALK. Just talk be it to friends, family or professionals. It is easy to self-diagnose and even to attempt to self-treat or self-medicate, to rehash all the column inches that you have read on a subject. In some cases, genuinely all that is needed is the textbook advice. What if things don’t get better despite following all the good advice? Actually, it just means we are all human. We are all different; big, short, thin or large. Today, I am reading a report on genetic links to susceptibility to depression. Again, re-enforcing that we haven’t all got this way, the same way. How can we possibly believe that we can all get rid of stress the same way? I also think it’s interesting that we are told how to ‘eliminate’ stress from our lives. We need stress, we need in the words of Sir Alex Ferguson ‘squeaky bum time’. Some thrive under pressure, it can be motivating. Stress occurs when pressure becomes excessive. We need to learn how to manage it. We need to take back control of what we use it for and not let it be used against us to drive performance or hit targets. Above all, we need to talk about why we are stressed, talk about how we manage it, talk when stress is getting on top of us and talk when we have it back under control. It’s these conversations that bring stress into the light and help manage it. Stress that’s left unchecked can affect your body, your thoughts and feelings, and your behaviour. It can become debilitating. Consequently, beyond workplace absenteeism, it can also contribute to many longer-term health problems, such as high blood pressure, heart disease, obesity and diabetes. It’s definitely time to stop and consider how stress affects you and your workplace. Craig Fearn from Lighthouse Mentoring provides mental health and wellbeing mentoring and training services for individuals, businesses and organisations. Craig helps create an environment that promotes and supports employee wellbeing and positive mental health in workplace.